Invest in violence intervention and prevention strategies that provide support for at-risk youth and young adults to interrupt the cycle of violence and recidivism. Fire Safety: $2 million annually for maintenance of adequate personnel resources to respond to fire and medical emergencies including, but not limited, response to homicides and gun-related violence and investigate fire causes. Police Services: 60% of remaining Measure Z revenue (approximately $12 million annually) for maintenance of sworn police personnel and Geographic Policing (including Crime Reduction Teams, Community Resource Officers, intelligence-based violence suppression operations, domestic violence and child abuse intervention, and Operation Ceasefire). Community-Focused Violence Prevention and Intervention Services and Strategies: 40% of remaining Measure Z revenue (approximately $8 million annually) for investment in collaborative strategies that focus on youth and young adults at highest risk of violence such as: (a) Street outreach and case management; (b) Crisis response, advocacy and case management for victims of crime; (c) Reentry programs; and (d) Young children exposed to trauma or domestic and/or community violence. Oakland Unite staff coordinate to complement other local fundraising and violence prevention efforts. 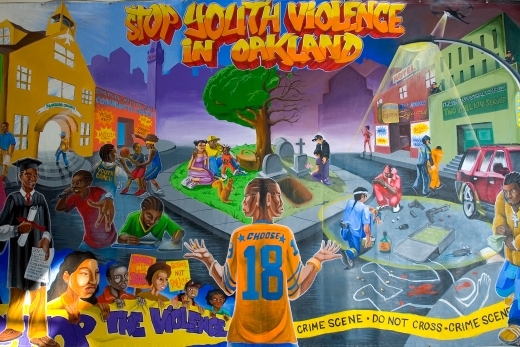 The best Oakland Unite work continues to be done at multi-agency, collaborative tables such as in the Intensive Youth Case Management sub-strategy where a sophisticated community/ public agency partnership has been developed. Inter-agency Gang Prevention Collaborative (IGPC) meetings provide a venue for focused violence prevention collaboration, convening Oakland Unite service providers, OUSD, other community agencies, and HSD staff together. Oakland Unite staff also participate in a number of other collaborative efforts including the Alameda County Reentry Network, California Cities Gang Prevention Network, and the City of Oakland Commercially Sexually Exploited Children Task Force.